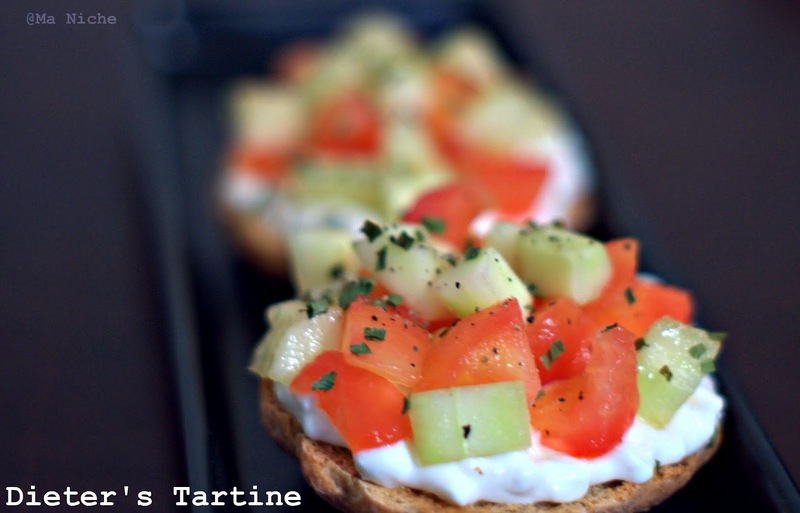 This week we assembled Dieter's Tartine for French Friday's with Dorie. I say assembled, because that is exactly what we had to do. Just toast a slice of bread. Mix sour cream and cottage cheese . spread it on the toast. Spoon diced tomatoes and cucumbers on top. Season with salt and pepper. Sprinkle some chives and herbs if you please and your tartine is ready to eat. It was as easy as that. But really tasty and satisfying. Apparently this pretty tartine is extremely popular with "ladies-who-lunch in Paris" since it is filling but not fattening. There they make is with non-fat fromage blanc. However Dorie said that a substitution of non-fat cottage cheese thinned with non-fat sour cream works just as well. Prior to this we did not have much regard for cottage cheese. But the combination works and really makes for a great lunch recipe. I feel that served on slices of cocktail bread(like this one here) a tartine will be great to nibble along with a shot of tomato juice or tomato soup depending on the season. Try it which ever way you please its a great combo and I highly recommend it to you ! update: 7/29/2013. Over the weekend we tried the tartine with a sprinkle of Herbs de Provence. It definitely makes a difference. The bottle of herbs was a bit expensive but it was so worth it.. 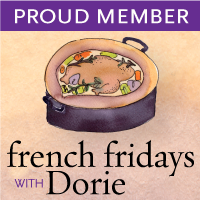 Being a member of french fridays with Dorie, i cannot publish the original recipe in the blog. You can however this recipe here. For many more delicious recipes such as this one order your copies of Around the French Table from Amazon or from The Book Depository and join us as we cook our way through the book. 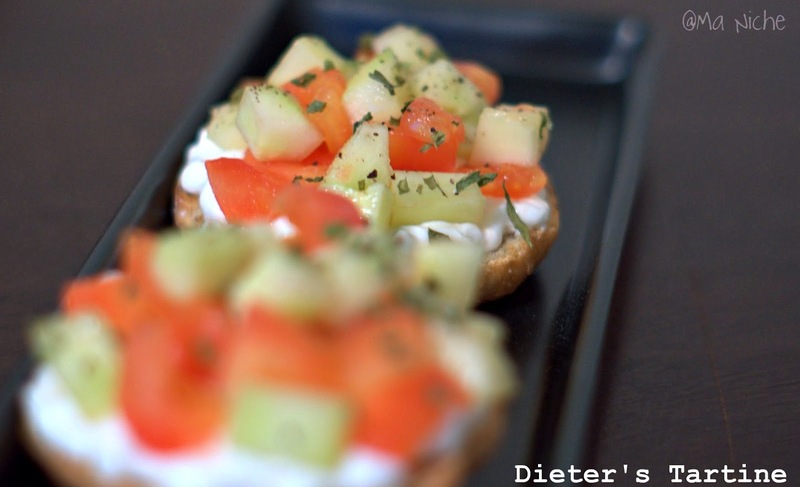 Very lovely and elegant presentation of your "dieter´s tartine" - cottage cheese is quite nice, I agree, especially in summer time, it makes for a wonderful alternative to other sandwich spreads. I agree with Andrea - lovely presentation! I think this is a versatile method for enjoying all the freshness of summer vegetables. Hey, if nothing else, this recipe has converted you to cottage cheese. Great job! Healthy, pretty, and delicious! Nice job on the tartine! Elegant & tempting clicks.. Love that vibrant color portrayed against black ! Yes, the addition of a little sour cream made the cottage cheese much more interesting to me. I never found it to be a very exciting cheese either, but I never realized how low in calories it really is either. Thats why I loved this tartine because it really balances flavor and calories in a way that doesn't make you feel like you are depriving yourself of anything. I loved this recipe, as well. This tartine just works for a quick and filling lunch. I enjoyed the sour cream/cottage cheese combo but did not gi with the non-fat. I'm in Julia's corner on non-fat. Just doesn't work for me. Loved your phots. Assembling is a good descriptor of this "recipe" - the ease was terrific for a busy week. The photos are stunning.